At some point Uhtred had to break. At some point The Last Kingdom had to move past the musing on conflicted values and get to the consequences of such a state of being. For months now Uhtred has been proving his loyalty to Alfred, the Saxon King and ruler of Wessex, while also rebelling against many of his ideals and attempting to hold on to his Danish upbringing and traditions. For the most part, Uhtred has been able to succeed in playing both sides, his claim to Bebbanburg certainly substantial, even if his lack of Christian faith, and lack of standing within Alfred’s kingdom, have largely kept him from moving towards his goal of becoming an Alderman. This week sees Uhtred finally break though, as he comes to realize that all the sacrifices he has made may in fact be fruitless. I’ve mentioned time and again that Uhtred’s rashness is both his greatest asset and his biggest weakness. While it gives him a defining courage that’s kept him alive through a number of hostile situations, it also hinders him from seeing too far into the future and truly assessing how to get there. All he knows is that he wants to get his land back, but he’s never thinking more than a few steps (at most) ahead. When, a few episodes ago, Alfred told him that the first step to becoming an Alderman was to dedicate himself for one year of service within the Saxon army, he didn’t hesitate to take on the role, despite the fact that it led to him separating from Brida. Uhtred is eager to please, and eager to selfishly gain, so he ponders little beyond the present. Such hotheaded actions lead to tonight’s series of consequences, all of which seem to change Uhtred. With half of the Saxon army waiting on top of a hill, looking down on Ubba’s camp below, there are very few options for the army headed by Odda the Elder. They can either attack and likely be slaughtered, or hold their advantageous position and hope that the Danes don’t wait them out, therefore going through all of their rations. This is where Uhtred’s hurried decision making comes in handy. He offers to sneak into the Danish camp and light their boats on fire, causing a panic that will make it easier for Odda and his men to attack immediately. Of course, Uhtred is putting all of his trust in the Saxons, and while it pays off this time, Uhtred isn’t exactly rewarded for his loyalty. When he burns the ships he tries to make his escape, only to be confronted by Ubba, who wants to fight him to the death. The two battle for some time before Ubba gets the upperhand, only to see Uhtred grab a sword and slice both of the giant Danes’ Achilles heels—it’s one of the season’s more disgusting visuals. In fact, much of “Episode 5” is a visual feast, disgusting or otherwise. After Uhtred kills Ubba, the rest of the Danes begin to move in on him, and the following shot, which sees Uhtred backing away into darkness before a plethora of Saxon shields appear behind him, is stunning. It suggests that Uhtred has finally proven his loyalty and can be accepted by Alfred, the Saxon army swarming around Uhtred and protecting him. Once back in Wessex though, things change, and that’s when Uhtred realizes that no amount of valiant behavior will bring him closer to his goal of taking back Bebbanburg. 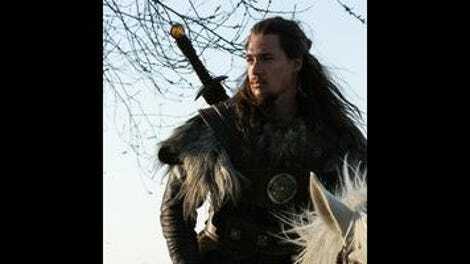 When Uhtred returns he sees that Odda the Younger has taken credit for slaying Ubba, and when Uhtred interrupts Alfred’s prayer with the intention of telling the truth, he orders him sentenced to humiliation, forced to crawl through Wessex while the villagers throw mud and food at him—and young Aetholwold, it should be noted, who gives quite the performance for the leering crowd. Uhtred’s show of loyalty should get him what he wants, but as he utters time and again, there seems to be no sense of justice in Wessex. When he refuses to have his child baptized, and also refuses to kiss the cross after his humiliation, it shows that he’s not only removed from the Christian faith, but feeling betrayed by the Saxon people. He trusted Beocca and Alfred, but as always, that was a rash decision. What had they done for him to instill such trust? In his haste to get Bebbanburg back he failed to see that Alfred, and many of the Saxons, will never accept him, no matter how much he tries to distance himself from his Danish upbringing. More than just realizing that he can’t trust the Saxons, there’s the suggestion that they might not be that different from the Danes. The Saxons have always chastised the Danes for being cruel and disgusting, living by no real laws and without any sense of religion (despite that whole Valhalla thing). When Uhtred is made to crawl through Wessex and sees the people angrily throwing mud and food at him, laughing at his expense, there’s clarity and betrayal on his face. He’s pushed aside his Viking ways in order to align himself with Alfred and the Saxons, but they’re no more trustworthy, pious, or pure. They’re still human, and prone to cruelty and narcissism. Ultimately, Uhtred breaks down. He refuses the cross, leaves the castle in anger, shouts at his wife, and then slaughters his servant. Sure, that servant was taking timber from Uhtred’s land and selling it for his own profit, but the unhinged rage we see in Uhtred’s eyes as he runs the man down is different. He’s never been this angry, and the emotional gut-punch that is that moment is the result of the slow build of the first four episodes. 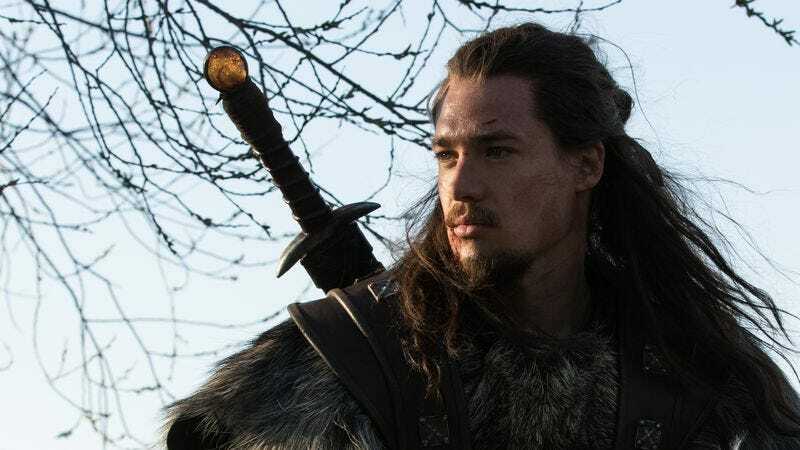 We’ve seen Uhtred do everything he can to lead a good life, and while he hasn’t always made the best decisions he’s certainly had the best intentions. To see him cave, and murder an unarmed man, is absolutely devastating. Lots of beautiful landscape shots in this episode, contrasting the vastness of the territory with the intimacy of the battles. Another great visual: Uhtred lighting and slinging the fireballs into the Danish ships. And another: the burning ships providing a backdrop for the brutal fight between Uhtred and Ubba. Who makes you more angry: Odda the Younger or Alfred’s wife? It’s almost too close to call.